The fireworks went off at halftime in Saturday night’s game between the University at Buffalo and Delaware State. Usually such explosions are preserved for the end of the night, but at that point the score was 34-3 in favor of Buffalo. With a good chunk of the crowd of 17,959 already headed for the exits, why not give them a little send-off? 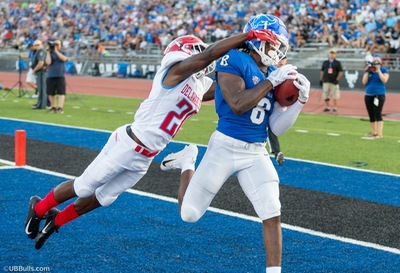 Such decisions were the order of the night at UB Stadium as the Bulls opened their season. For those who didn’t stick around, the final ended up 48-10. It was a night when the biggest decisions were when to pull the starters and how not to run the score up too high. That may not have meant 60 full minutes of entertaining, dramatic football. But on the other hand, it’s a sign of progress for the Bulls as they began the most anticipated season in recent history. 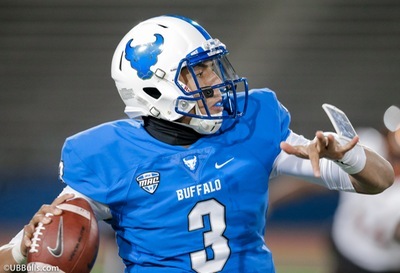 No one expected UB to stumble out of the game against a FCS opponent that went 2-9 last season. Still, if the Bulls had looked less than sharp – let alone less than dominating – it might have sent a few alarms out into the atmosphere. No worries about that. It was 20-0 after 15 minutes, as Buffalo clearly was the better team. And Tyree Jackson was clearly the better quarterback. Jackson put up some good numbers as he set about proving that he belongs in the conversation of the nation’s top throws. The most conspicuous of those was the five, count ‘em, five touchdown passes that came in the first half. No Bulls’ quarterback had ever done that before. He finished with an efficient 17 of 27 for 189 yards with no interceptions. About the only surprise was that Anthony Johnson, destined to spend the season being called a “probable first-round draft choice,” only had one of the scores. He did catch four passes in the first half. For the record, K.J. Osborn and George Rushing divided the other two scores – none going for more than 20 yards. Jackson finished with six TDs, getting one more after the half (Charlie Jones) before exiting for the rest of the contest. The offense finished with 354 total yards, rolling up 5.4 yards per play. On defense, UB might have been even better than its offense – relatively speaking. Delaware State had a grand total of minus-5 yards passing in the first quarter. If you throw out a 40-yard pass in the second quarter, the halftime number would have been minus-1. The Hornets didn’t get into the end zone (not counting an early field goal) until a few minutes into the fourth quarter. The stat of the night on the defensive side for Leopold might have been Delaware State’s four fumbles – three of which ended up in UB’s hands. A game like this probably can’t reveal too much about a team’s future. But taking care of immediate business is never a bad sign. For the sake of entertainment value, the Bulls are happily done with FCS opponents for the season. With this finished, it’s time to move it up a notch in terms of the level of competition. Buffalo plays Temple in Philadelphia next Saturday. The Owls are coming off a game with an FCS opponent as well, but there were no fireworks for them there. Villanova shocked Temple, 19-17. You can expect the Owls to arrive for that one in bad humor.